If you need DIY catering inspiration, check out this post on the kitchn, which is based on the full series over at FORKABLE. Very cool! 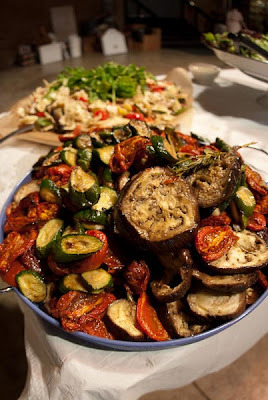 Wow -- my boyfriend and I were just saying, the other day, that we would love a huge platter of grilled vegetables for our (future, hypothetical) wedding. Thanks for the link! Love your site! SH: I wanted to do Lasagna too, but we didn't have enough oven space. I think its a great idea. Who doesn't love lasagna? Name one. I can't either. Looks gorgeous, great idea if you have family that loves to cook and has plenty of storage space in the fridge and freezer. Forkable: exactly. Plus, it's easy to make vegetarian, which I actually prefer to meat lasagne! We're lucky-- our venue is a summer camp and there is a commercial kitchen available. The plan is to make lasagne ahead of time, freeze it (we'll have to empty our freezer before, or if we get this out we have a contract in on, we'll invest in a deep freezer), and cook it all at the reception. Self catering is such an awesome idea! My mother and aunts cooked for my sister's wedding yrs ago and it turned out awesome! Everyone loved the food and it saved a ton of money. I'm currently planning my own wedding and besides the saving money factor, most of the catering companies I've tasted aren't so tasty for what they charge! Thanks for the link!